We recently took a look at one of the most powerful tools in Pro Tools, Beat Detective, going through its features and what it can do for you. In order to keep the article decent sized, we decided to create a second article in which we will walk you through using Beat Detective on an actual session – and what better example than drums, where Beat Detective really shines. As you can see the tempo was already mapped using the Identify Beat command so no need for using Beat Detective for creating a time reference. But are the drums on time even so, with the tempo mapped after the first transient of every bar? No, not really. So let us invoke Beat Detective. The first thing we have to do is select the audio we will be working on (tip: use link edit and timeline selection and the grabber tool) then use the capture selection button to define a selection Beat Detective will be working on. You can also introduce the selection manually. Next, select what kind of time sub-divisions does the selected sequence contain and the time signature. In our case, I selected bars 1 through 9 and the song is in 4/4 containing 16th notes (that would be the hi-hat). Be sure to be in clip separation mode. Next, hit Analyze and then proceed to play around with the sensitivity and the resolution and analysis algorithm until you see trigger events on every relevant transient information. If any triggers appear in places where they do not belong or if a transient that should have triggered Beat Detective does not have a trigger you can add/ delete triggers using the grabber tool. By clicking anywhere in the audio clip with the grabber you will add new triggers and by using the modifier key Alt/ Option with the grabber you can delete trigger events. In this example, I made sure that every kick and snare trigger Beat Detective and I added one trigger right at the beginning on the second 8th note of the first bar and deleted a trigger that was an error of the analysis process. After making sure your triggers are right, add a little padding time (2-5 ms will do) and click on separate. Doing so will create new clips between trigger points. 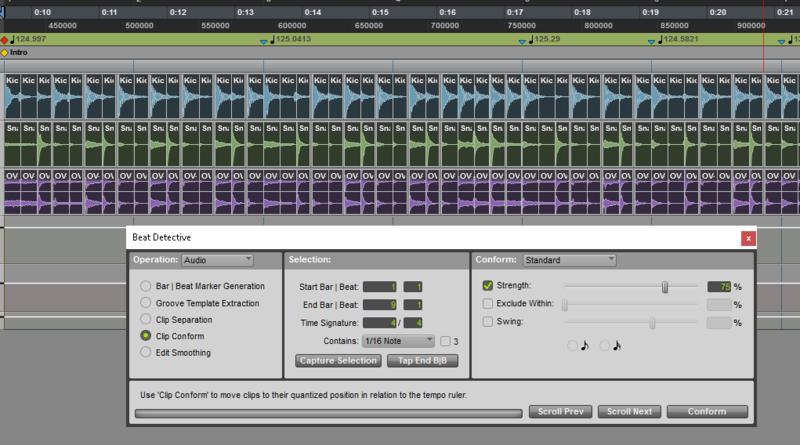 Now, it is time to snap the transients to the grid and get those drums on time. To do so we have to switch from the “Clip Separation” mode to the “Clip Conform” mode. You have three parameters in this mode: Strength, Exclude Within and Swing. In this case, I decided that I want the algorithm to move all trigger events 75% closer to the grid. The Exclude Within parameter lets you choose whether to move events if they are close enough to the grid and how close is actually what you control with the slider. I decided I do not want swing as the drummer played with enough swing. You can see in the picture that hitting conform moved the clips around and left many gaps between them. Because this process leaves audible artifacts we need to edit the clips so they do not have gaps and they start and end without abrupt amplitude information. That is why there is an “Edit Smoothing” mode. Smoothing and Creating Batch Fades. I zoomed in so you can see the result of the smoothing process. Where there was once a gap between two clips which have been moved now there is clip information and a crossfade between two clips. You have the option whether you want Beat Detective to create batch fades or not and how long you want the fades to be. 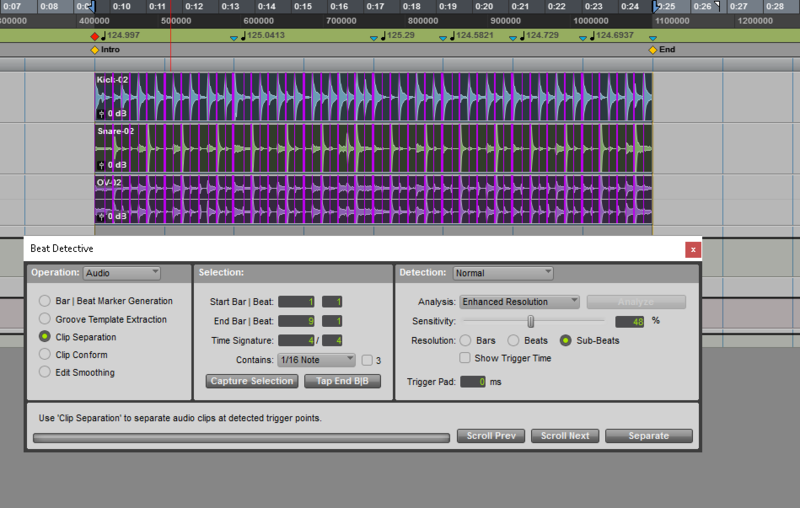 I chose the Fill and Crossfade mode with a 5ms setting. After this editing, I can no longer hear the artifacts created by the separation and moving of clips and my drums are perfectly on time. Voila! Beat Detective is incredibly powerful and editing drums is one the things it is best at. Try your hand and practice using Beat Detective as it is one of the most valuable tools you will ever learn within Pro Tools.